The sad reality is this: Italy is moving to the Israeli camp. This is not only pertinent to political alignment, but in the reconfiguration of discourse as well. Israeli priorities, as articulated in Zionist hasbara (official propaganda) have now become part of our everyday lexicon of Italian media and politics. As a result, the Zionist agenda is now part and parcel of Italian political agenda as well. Then, Italian leaders were perfectly aware of the country’s unique position in the Mediterranean area. While they were keen on displaying loyalty to the Atlantic Alliance, they also established good relations with the Arab world. Maintaining this balance was not always easy and had led to what it is now being perceived as ‘radical choices’, which are now being disowned and criticized. The pro-Israel trend has been in motion for years. In a famous interview with the Israeli newspaper Yediot Aharonot in 2008, former Italian President Francesco Cossiga declared: “Dear Italian Jews, we sold you out”. Cossiga was referring to the so-called “Lodo Moro”, an unofficial agreement, which was allegedly signed in the 1970’s by Italian Prime Minister Aldo Moro and the leaders of The Popular Front for the Liberation of Palestine (PLFP). Its understanding supposedly allowed the Palestinian group to coordinate its actions throughout the Italian territory, in exchange for the PLFP keeping Italy out of its field of operation. In the interview, Cossiga went further, blaming the Palestinian group for the Bologna massacre, a terrorist bombing which devastated Bologna railway station in 1980, killing 85 people. Cossiga’s words may have pleased Israel, but were baseless. The attack then was the work of an Italian neo-fascist organization. Unfortunately, the nonsensical allegations were not isolated. The example is representative of the general change of attitude towards Palestine and Israel, one that is largely predicated on re-writing history. In 1974, the Italian government advocated for Palestinian leader, Yasser Arafat’s participation in the United Nations General Assembly; in 1980, it committed to the EEC Declaration of Venice, which recognized the Palestinian ‘right to self-determination’ and, expectedly strongly opposed by Israel and the US. Throughout the 1980’s, the attitude of Italian government was openly pro-Palestinian, which often lead to foreign policy clashes with Israel and its American benefactors, especially during the so-called Crisis of Sigonella in 1985. During a speech at the Italian Parliament, socialist Prime Minister, Bettino Craxi, went as far as defending the Palestinian right to armed struggle. In 1982, the Italian President Sandro Pertini talked at length about the horror of the Sabra and Shatilla massacre in his traditional end of the year address to the Nation. But things have changed as Italy is now living in its ‘post-ideological age’, where morality and ideas are flexible, and can be reshaped as needed to confer with political interests. Today, left-wing parties don’t feel the need to stand for oppressed nations. They are too beholden to the diktats of globalization, and are thus driven by selfish agendas, which, naturally brings them closer to the US and Israel. While neo-liberal politics has ravaged much of Europe in recent years, Italy proved that it is not the exception. Even that half-hearted move angered Israel, promoting the Israeli ambassador to Italy to protest. The Italian prime minister moved quickly to reassure Israel. Matteo Renzi spoke harshly of UNESCO’S proposal. “It is not possible to continue with these resolutions at the UN and UNESCO that aim to attack Israel”, he said. One year earlier, Renzi had officially reaffirmed Italy’s commitment to Israel in the Israeli Knesset, declaring: “Supporters of ‘stupid’ boycotts betray their own future”. During his inaugural speech, Italy’s current President Sergio Mattarella addressed the ‘menace of international terrorism’ by mentioning the attack in front of The Great Synagogue in Rome, in 1982. His words “deeply touched Italian Jews”, according to the right-wing Israeli newspaper the Jerusalem Post. According to Ugo Giannangeli, a prominent criminal attorney who devoted many years to defending Palestinian’s rights, the Italian Parliament is working on several laws, with the sole purpose of winning Israel’s approval. One of these initiatives is Draft law 2043 (Anti-discrimination act. 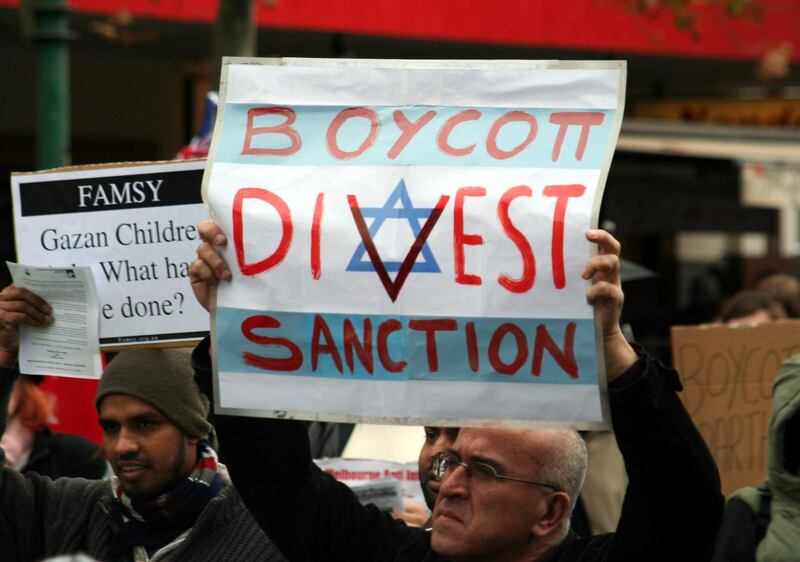 It ought to be called the Anti-BDS act. The signatories compare boycott of Israel to “disguised anti-Semitism”. If approved, the legislation would provide exemplary punishment for BDS campaigners. Among the signatories is Emma Fattorini, member of the Italian Democratic Party and also member of the “Committee for the protection and promotion of human rights”. Palestinian rights, are of course, of no concern to Fattorini at the moment since it appears nowhere in her ‘human rights’ agenda. Another signatory is Paolo Corsini, who abandoned the Democratic Party and moved to left-wing party MDP – Articolo 1. Corsini was also the rapporteur of the “Agreement between Italy and Israel on public safety”, already ratified by the Italian Parliament. The agreement strengthens the relationship between the two countries at a more effective way, in exchange for Israeli sharing of information on public order and how to control mass protests. Only few voices are being raised against Italy’s political and cultural subordination to Israel. Italian politician Massimo D’Alema, also a former Foreign Minister, criticized the changing Italian policies. In an interview with the Huffington Post, he criticized Italy and Europe over their willingness to please Israeli leaders. He called on the left to reclaim its historic role in support of the Palestinian people. – Romana Rubeo is a freelance translator based in Italy. She holds a Master’s degree in Foreign Languages and Literature and she is specialized in Audiovisual and Journalism Translation. An avid reader, her interests include music, politics, and geopolitics. It seems that there is a great deterioration in attitudes in Europe. The anti-Russian mantra penetrates so easily- kook at Theresa May’s speech pretending Russia is interfering. The US is out of control, with all media on the same line, with no evidence. The USA’s virtually 100% support of Israel in the “US Congress” is spreading, and now with Israel working with Saudi Arabia and the UK, France and Russia providing arms and the US,UK helping destroy the poorest Arab nation, Yemen, there is little room given to the truth about Palestine, Syria, Iran in any of the corporate media.